Asset Fruit have been supplying concentrated lime juice since 1989 and now export to over 20 countries worldwide. We also supply lime peel and distilled lime oil. Our customers range in size from large multinational food and drink companies to small family run businesses. The world standard, our juice is manufactured from Citrus Aurantifolia and can be produced to a variety of specifications. 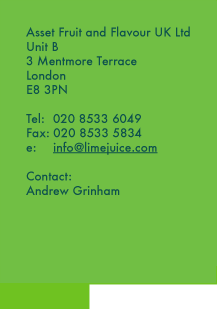 Our lime oil, sourced from three different countries, is produced to the highest industry standards. We are one of the largest suppliers of dried lime peel to the pectin market.